About 6 weeks ago we received an email. The local 4H had purchased eggs and then hatched them out in an incubator and the birds had no where to go. Sure, we will take them! The brooder was empty and in they went. Now this small flock is in a small field pen. 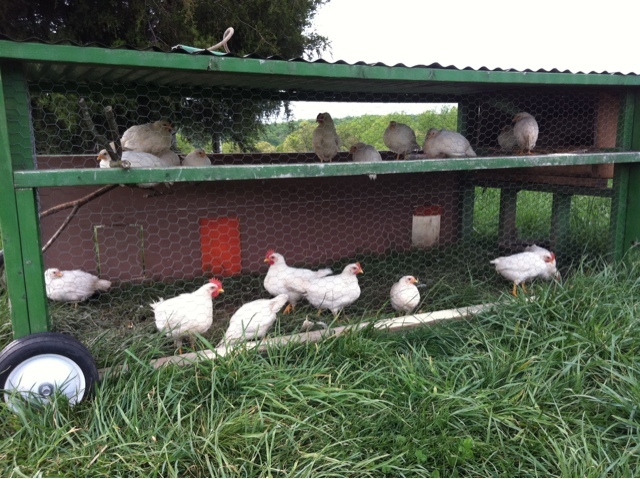 The flock came from eggs which means it was a straight run..a mix of males and females, White Leghorn variety. White Leghorns are the birds used in egg production houses. Thinner birds who mature earlier and average many more eggs per week than the heritage breeds that comprise the rest of the flock. It is already obvious which are males, and soon they will be separated out so the females can grow with less..hassle..and begin making eggs!